Sometimes, you’ll see a rumor about a new model that just kind of leaves you gawking dumbly at the screen while your brain tries to process everything you’ve just read. 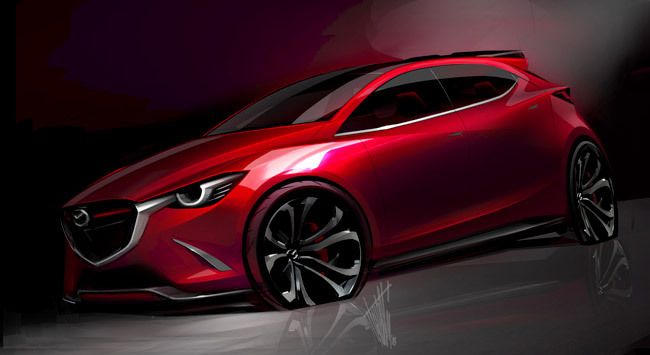 There have been a lot of plausible rumors going around about the Mazda2 (spoilers: it’s the HAZUMI) and about the return the rotary engine (spoilers: if it happens, it’s likely to be a one-off kind of deal). And then there’s this one: Mazda is mulling the possibility of making a Mazda2 PHEV with rotary range-extender. Of course, there’s actually some founding to this rumor. Mazda rolled out the Mazda2 RE Range Extender with a rear-mounted 330cc Wankel engine back in December 2013 mere months after production closed on the rotary engine-powered RX-8. While a next-gen, KODO-bodied Mazda2 PHEV with rotary range-extender sounds like a pretty novel concept, it remains to be seen whether the automaker will follow through or not. A recent report suggested that the brand was toying with creating a special edition vehicle with a rotary engine in time for the 50th anniversary of the Cosmo Sport. Auto Blog’s suggestion that the PHEV version of the Mazda2 would not emerge until at least the 2016 model year indicates that there could be some fortuitous timing at work.